I have my 1997 Big Dog Vintage Classic Cruiser for sale that has a 1340cc S&S engine and only 10,600 actual miles. If you are interested in the cruiser please email me your questions or make an appointment for viewing using the comments form found directly below this classified. Thecustom motorcycle for sale in this classified is very clean and has always been garaged. Strike Lightning also invites anybody who may be having any problems with a Big Dog Motorcycle to leave their questions or describe the exact problem that you're having and your contact information in the space below and see if somebody who stops by may offer a solution for how to fix your motorcycle. 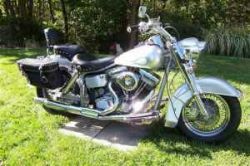 We also encourage bikers to submit their opinions and reviews of the 1997 Big Dog Vintage Classic Cruiser for sale to help potential buyers make informed decisions and to benefit the biker community as a whole. The Big Dog Cruister is located in Lawrenceburg Indiana and my asking price is a very reasonable $8,600. I have owned 3, 99 pro sport stolen in az during bike week, 04 boxer that has been a paper weight for the last two years due to poor electronics installed by Big Dog. They replaced the EHC once and it failed again. I have since striped the entire bike of all electronice and I am in the process of rebuilding it using Wire Plus system products (Don at WP has gone way out of his way to be helpful) I documented the problems with this bike & was ignored by big dog. 5000 miles never knowing what was going to fail next..I also purchased a used 99 vintage sport & the older electronics are a little better. Now as much as I detest the HD Co I have logged 2 trips to the east coast & once to the west, DC twice and NY all on twi different Ultras an 02 & an 08..unless you are a great wrench buy reliability..Most of the BD mc's prior to 05 have problems. just google & you will see. If the guy who stole my 99 as well as the bd chopper from Mesa Az gets this I wish you ill. Woody UMC V.P.